“Misbehaving 4-year-old may have a disorder,” headlines an advice column in a major metro newspaper (“Ask Amy,” Philadelphia Inquirer, 10-22-07). Almost daily, children’s behavioral problems are in the news and the parents’ complaint is often the same: something is not quite right with my child. These puzzling behaviors can take many forms—social isolation, disruptive behavior, failure to learn, excitability, inability to follow directions… What’s a parent to do? Curtis, a clinical psychologist and director of Lifespan Psychological Services in Washington state, asks parents to take an involved, detailed inventory of their child before seeking professional help. Curtis shows parents through a step-by-step procedure how to clarify and document concerns. Included are several pages of reproducible worksheets: problem-tracking sheets, time line/stressors, causal factors, and more. These worksheets will help parents not only discover possible causes for behavioral problems, but also aid in the choice of professional help. Clearly, this is a no-easy-answers approach, and Curtis insists parents must profile the child before blindly choosing professionals and starting behavior-altering drugs. An excellent bibliography, organized by topic, includes books and Web sites, as well as a glossary of terms. Lifespan’s publishing goal is to provide self-help resources for parents and professionals, and this book fills that need without advertising its own services. 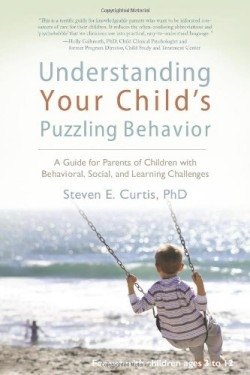 Understanding Your Child’s Puzzling Behavior is an excellent book for parents and caregivers.